The question I get asked the most, hands down, irrefutably........ sadly has nothing to do with my "wonderful" (aka acerbic tongue) personality nor "chic" (aka same clothes/different day) outfits. It's actually about my Hermes Kelly. What leather/size? Where did you get it? How much? How do I get one? Will you ever sell it? Which style should I get - retourne or sellier? What is it about this bag that's so fascinating? I named this post - Slave To Hermes, a phrase coined by my friend, Anne of Ritournelleblog which isn't all that far from the truth. Rather apt really considering most of the delightful ladies I've met in the last 2 years have been from forums/blogs that exacerbated and fueled our obsession with the brand. Who knew that an infatuation with Hermes could lead to friendships that spanned the globe? I've seen mature and normally sane women behaved worse than a pack of baboons fighting for survival at the Hermes sales. Even one of the world's greatest generals, Genghis Khan would've admired and perhaps learned a thing or two from their tactics, carefully planned strategies and sheer determination to conquer the mother of all H sales. I've dragged a few friends into an Hermes sale or festival and then get a phone call from their other half a couple of days later thanking me *insert sarcasm* for corrupting their wives. Hey, I'm just spreading the H love around. Hermes is well versed in subtle "marketing" which is more of a gently gently method. Majority of the designer houses these days consider handbags as a money making machine. Little wonder seeing how many of us would rather spend our money on handbags but buy our clothes from Uniqlo or ASOS. Great efforts are made to squeeze every bit of profit from the sales by reducing operating costs wherever possible. That could be moving their manufacturing abroad, increasing the price of the goods year after year or even using cheaper materials to line the bags. 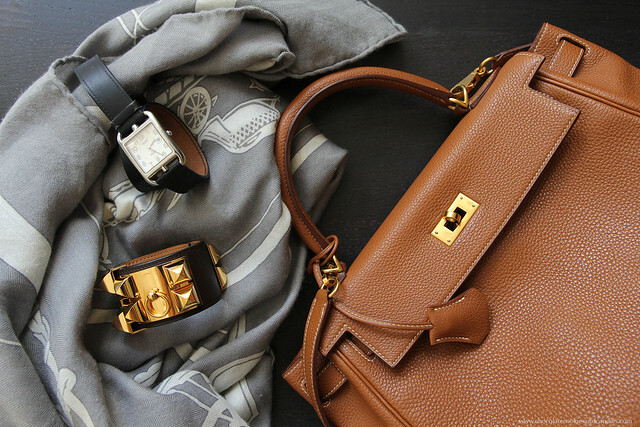 Not that I can afford a stack of Hermes goodies but these 4 items are my current favorites. The Ex Libris shawl which I called every store in the U.K for months on end until they got tired of hearing my voice. I then found a stash of them at the sale. Go figure. I'm loving the Collier de Chien more and more because it stops me from turning into a middle aged boring ol' fart. As for my watch, I'll be lost without it or rather....I'll be late to everything. I remember feeling faint and just about passed out from shock when the SAs told me how much a Kelly cost 10 years ago. Now......it's twice as much. Such a great post! I've seen a few women (read: two) with an Hermes in Wellington, which is surprising in itself as these obviously have to be sourced abroad. I truly admire their commitment to quality and artisanal work, it's almost becoming a lost art! I like the brand because of their dedication to quality and workmanship - always love looking at how things are made and I vividly recall your earlier post on that. I think I'd like a bag but I'm not so sure I can afford any in the near future.. apart from my one little consolation of a CDC! I love this post, I too am a slave to the brand. Ahhh - makes me love my slightly larger Kelly twin even more! I NEED that CDC!! Laura, yes you need a CDC! S, my whatpapp is kaput! Just in case if you'd texted me and I didn't reply.